Here’s another brand of pen that I am enjoying using with Spirograph and Wild Gears. The ink flows smoothly, and there is no problem with the size of the holes even on the old Spirograph with its smaller holes. 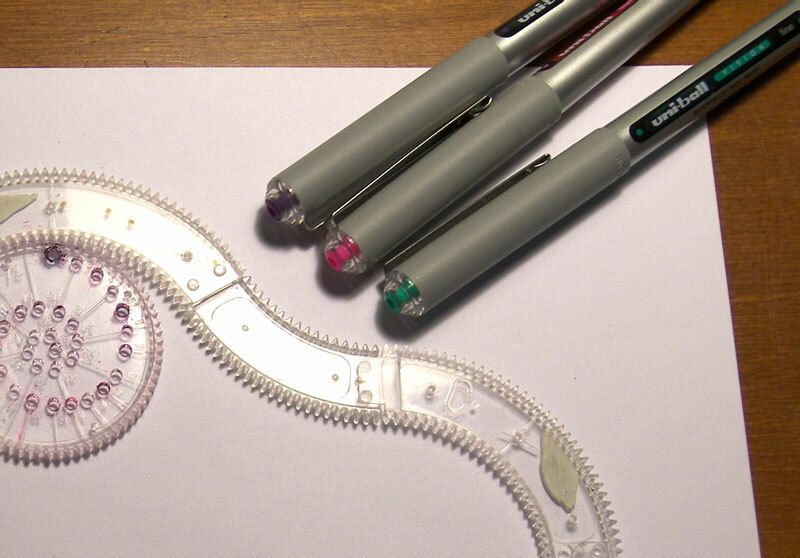 This pen doesn’t come in as many colors as the felt pens I’ve recommended for Spirograph before. But it feels solid, not flimsy, and is pleasant to use. You could also try the Needle-Point version (left), which looks like it has a finer tip, and comes in a package of 8 colors. If you try either of these, please let the rest of us know how you liked them by leaving a comment. I found my son’s Spirograph glitter set that we purchased as a Christmas gift in the the early 90s (I think). His daughter is trying to learn how to use it. Does anyone know what size pen tip works for this set? Also, I believe there was a glitter glue pen with this set. Does anyone know where a replacement can be purchased? Thanks! Is it the “Sparkle Spirograph” set in this video? It looks like a pen with glue in it (I wonder if you had to squeeze it to get it out), then you sprinkle sparkles over the result and blow them away, and they stick to where the pen passed over. Other than that, though, it looks like regular Spirograph parts. You should be able to use any fine-tipped pen to make non-sparkly designs. There are so many choices. 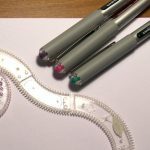 There are also glitter gel pens available now that you could try, though in my experience gel pens tend to smear easily because they take longer to dry, compared to felt-tip or ballpoint pens. I’ll make a new post about it, and see if we get any useful contributions! Has anyone tried colored pencils with Spiro? I was wondering about trying some Prismacolor Verithins–I’ve heard that they are the hardest colored pencil and will hold a point really well. I’ve done a lot of work with Wild Gears using mechanical pencils. I also bought a set of colored pencils at Costco. After the rather fine line laid down by the mechanical pencils, the colored pencils feel a bit like using crayons. Not that that’s necessarily a bad thing. The colors on the ones I have are rather muted and produce something vaguely reminiscent of watercolors. With the wide, imprecise line and the pastel colors it’s not a look I find all that appealing overall. I think the colored pencils are something you might use for a presentation piece where you’ve already developed a design and have a very good idea of where you want to go with the colors. It’s not something that’s likely to be rewarding just messing about and trying different things at random. They also don’t tend to combine as well as pens or fine line pencils in more intricate drawings. The set I bought does have a lot more implements than most of the pen sets I have so it does work well if you’re exploring one segment of the color palette, like if you want to use ten shades of green in one drawing. I tried some watercolor pencils, very gently, to see what would happen when I wet the paper. The problem would be the lead wearing down as you go around, even gently, and breaking off eventually. The metal tip of a pen doesn’t have this problem. But if you’re successful, do let us know!